Positive peace is more than the absence of war and more than the absence of structural violence and oppression. Positive peace alludes to a world in which everyone has more than their basic needs met and has an opportunity to be healthy, pursue their dreams, and enjoy their relationships. Positive peace can be guided by science, but it is motivated by ideals and values. Since the rise of science and the decline of publicly affirmed values, the primary focus of peace in the modern world has been on “negative peace”—the absence of violence and the guarantee of human rights. However, “positive peace” requires an assessment in relation to human values and responsibilities that have been divisive or neglected in modern secular society. Our first article on “Global Peace Index of Economies” by Unmana Sarangi discusses peace indexes. Good peace indexes include items related to “Positive Peace” that refer to individual well-being including things like healthcare, income, housing, and things that require production or service (e.g., labor); a“Negative Peace” items refer to personal security, protection of freedom, and the absence of violence. Negative peace is generally provided by government, while positive peace is related to the vibrancy of the economy and culture. 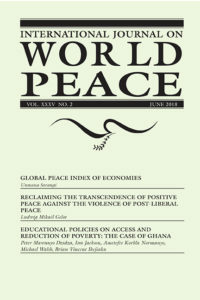 One important conclusion drawn from his research is that “positive peace” tends to grow in an environment of “negative peace.” In other words, states in conflict and war, or oppressive states, tend to see negative economic growth, while the absence of violence corresponds highly to economic growth, availability of housing, medical care, and development of social institutions and products that serve areas related to positive peace. In addition to his valuable descriptions of which states and regions are advancing and declining and possible reasons why, Sarangi concludes by observing that a more advanced peace index could be a good overarching measure of the general progress of a state. Our second article, by Ludwig Gelot, explains how an ontology of violence is built into the underlying political and philosophical streams of modern Western thought, including Realism, Liberalism, Neoliberalism, and Critical theory, all of which assume the world is shaped by arbitrary power relations. This underlying ontology is widely accepted by modern scholars of peace research. Thus the field of peace research is handicapped in its ability to advance discussions of “positive peace” and reverts to discussions of violence, war, and human rights, or negative peace. Gelot cites an article by Paul Diehl, who argues that energizing discussions of Johan Galtung’s concept of positive peace requires moving beyond the shackles of political science to draw important conceptual and normative insights from the humanities and social sciences that would define values and priorities beyond negative peace. However, Gelot provides an enlightening discussion of why the humanities and social sciences are unable to define such values when their analyses, driven by post-liberal and critical theory, are stuck in immanent reality. The solution is to reengage the discussion of transcendent values that are inherently related to positive peace. Transcendent values include human ideals and goals that transcend current reality. If scholarship related to current reality is fixated on power relations, then the field of peace research cannot make substantialprogress towards any economic or social goals. Gelot explains Judeo-Christian transcendent values underlie the values of positive peace highlighted by the social sciences and humanities. This includes the values and virtues that derive from the practice of love. Peace research needs to adopt an ontology that includes transcendence in order to go beyond the shackles that stop us from conceiving peace as more than not war. The Millennial Development Goals relate to values associated with “positive peace.” Our third article, by Dizdza et al., focuses on the role of education in reducing poverty, with Ghana as a case study. Poverty reduction is UN Millennial Development Goal 1 and Achieving Universal Primary Education is Goal 2. Education breaks the cycle of poverty, halts the spread of inequality, and leads to sustainable development. However, education is expensive, creating insurmountable barriers in impoverished countries in Africa. At a higher level of education, the chances of a person being non-poor increase, and being a public servant provides an advantage in retaining a position above the poverty line compared to the people employed in agriculture. This research validates the need for Ghana to emphasize access to both primary and secondary education by providing infrastructure, free education, and training for teachers at the various level of education. The authors compared the income in the service sector, which requires a higher level of education, to subsistence agriculture where poverty is the highest. Developing economies have a difficult time competing with already industrialized economies, so the major growth areas are construction, transportation, tourism, and other services. Education for skills in these areas is important. If the global peace index of economies drives home any single point, it is that “positive peace” cannot be developed unless “negative peace” already exists. Negative peace—physical security and human rights—is achieved through law and government force. Positive peace cannot be achieved by force, yet many people naïvely ask the government to provide it, and think passing a law will force other people to be more productive or serving. However, the cultural and economic spheres, not the government, are responsible for the elements of positive peace.